Sakuya randomly brings up how it’s pretty awesome to have the Lups fight alongside them against tough Ganglers. But Commander Hilltop reminds them that they are cops and the Lups are criminals. Tsukasa says they don’t know the Lups’ ultimate goal and Keiichiro makes a “That’s true.” face. Jim Carter alerts them to Gangler Enbyi Chiruda rampaging downtown. But the Lups are already there and get turned into children by Enbyi. Noel arrives followed by the Pats and they drive Enbyi away. The babyLups steal some clothes from a nearby stall to change out of their kaitou outfits. Sakuya picks up Umika’s VS Changer that she dropped. Keiichiro takes Noel with him to look for the Gangler while Sakuya and Tsukasa take the VS Changer back to HQ. The babyLups decide to retrieve the VS Changer themselves. They make Tsukasa and Sakuya believe they are lost children. Tsukasa says they will bring them to the nearest koban, but Kairi calls her “Mom”. Tooma says Tsukasa looks like their mother. Tsukasa can’t help babyKairi’s cuteness so they take them back to HQ. Sakuya takes the VS Changer back to their office while Tsukasa interviews the babyLups about their situation downstairs. Tooma asks to go to the toilet, but he really tries to look for the office. Commander Hilltop asks Jim Carter to take care of the VS Changer, but Jim Carter is busy looking for the Gangler. Hilltop places the VS Changer on the table as he leaves to talk to the higher ups. Tooma walks right into the office, but Jim Carter sees him. He calls Tsukasa. 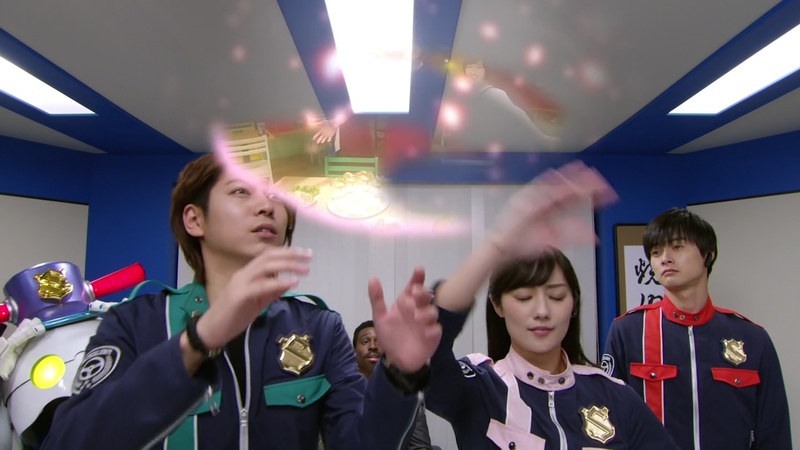 Tooma tries to grab the VS Changer, but Commander Hilltop walks in and decides to lock it in his desk. Meanwhile, Keiichiro asks Noel what the Lups’ goal is with the Collection. Noel says he can’t answer that since even he and Lups have no idea what’ll happen when they have the Pieces. Back in the office, Sakuya gives the babyLups some tea and treats. Tsukasa says they’ve contacted the local cops for help with finding their mother. The babyLups have a plan. 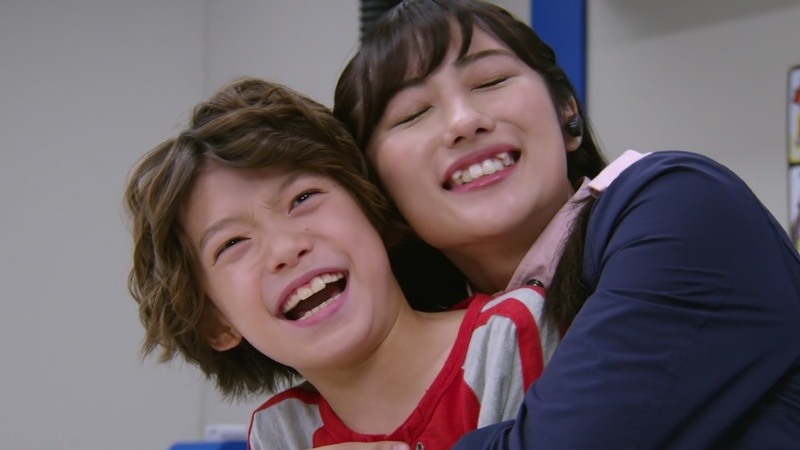 Kairi turns on his kawaii and gets Tsukasa to drop everything so she can play with him. Tooma and Umika pretend to play hide and seek, but it’s only to get Umika behind Commander Hilltop’s desk to secretly unlock the desk with the VS Changer in it. Umika grabs the VS Changer. Sakuya sees her just as she runs out of the room. Tooma knocks Sakuya to the floor and follows Umika downstairs. 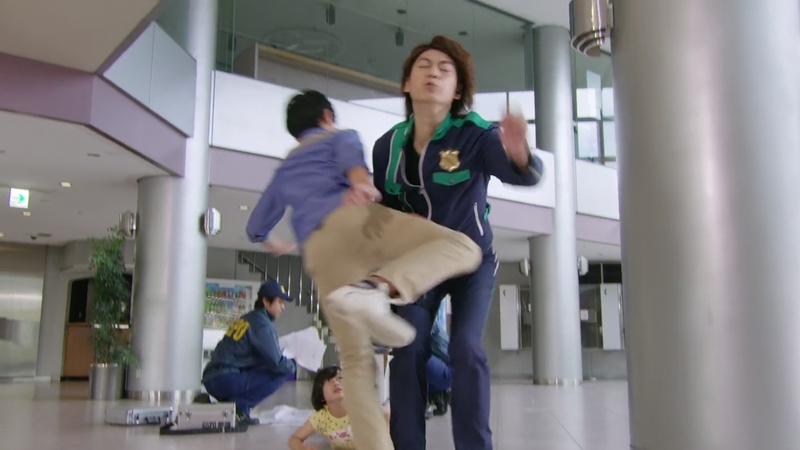 In the lobby, Umika trips when she steps on a GSPO worker. Tooma knees Sakuya in the balls and grabs the VS Changer to run outside. But Tsukasa cuts him off. Just then “Kairi” pops in and grabs the VS Changer before flying off. The babyLups feign an apology to Tsukasa and Sakuya. Jim Carter then comes running out to tell them about Keiichiro and Noel fighting Enbyi, so they hurry off. 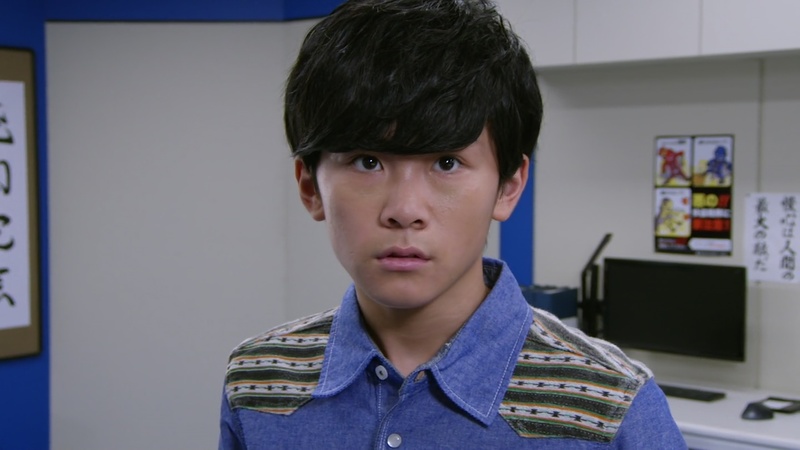 The babyLups’ “mother,” who looks exactly like Tsukasa, comes walking up and claims her children. Turns out the fakeKairi and this fake mom is actually Kogure in disguise. Tsukasa and Sakuya arrive to help Keiichiro and Noel against Enbyi. Good Striker arrives and the Pats go Ugou to finish off Enbyi’s first life. Goche arrives to embiggen him and the Pats hop into PatKaiser Trains and then PatKaiser Strong Biker while Noel hops into X Emperor Slash and Gunner. They finish off Enbyi for good. 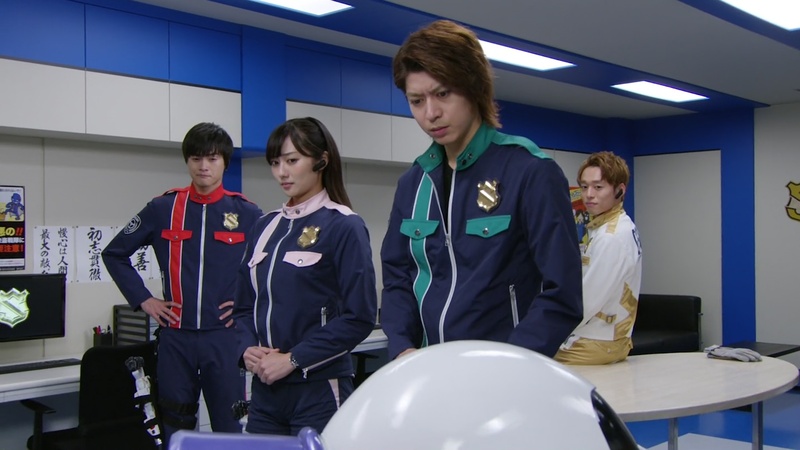 Back at the GSPO, Sakuya and Tsukasa bow and apologize to Commander Hilltop who also takes some responsibility for what happened. Jim Carter as well. 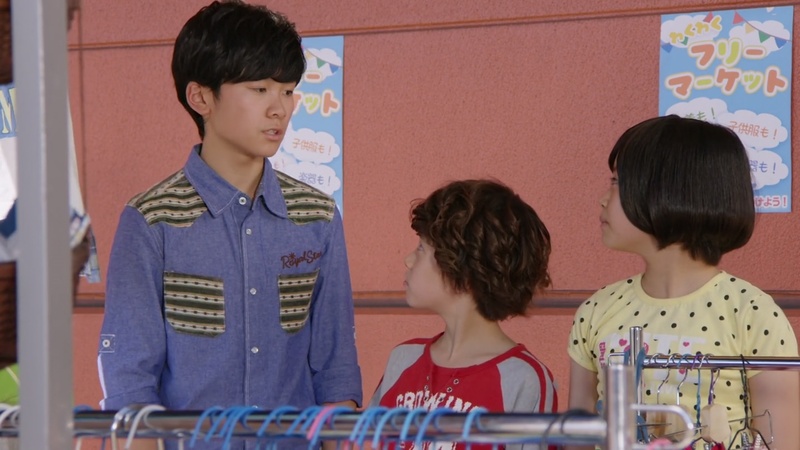 Keiichiro says at least the lost kids were returned to their parents. Noel says he wants to treat the Pats to dinner at Jurer and presents them an image of the Jurer trio welcoming them with open arms. Tsukasa erases that improbable image. Well, at least the Pats were idiots for only 1/3 of the episode. Actually allowing the Pats to finish off Enbyi on their own with no sign of the Lups was very refreshing. Honestly though, the best part of the episode was seeing young Hikari playing young Tooma. 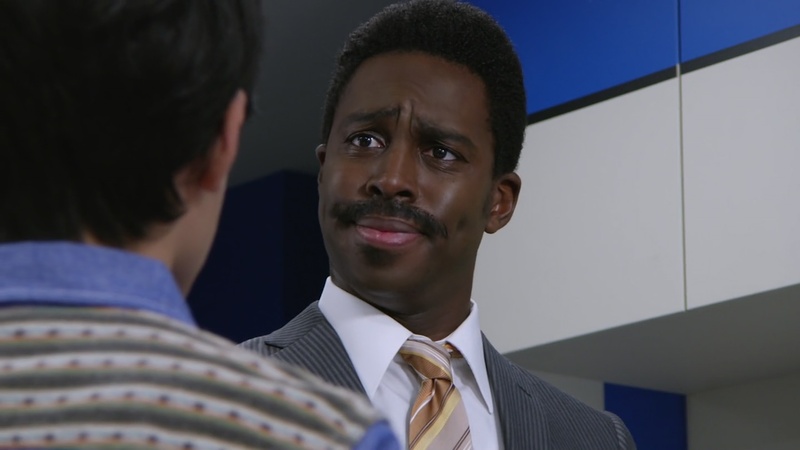 Makes me miss ToQger even more than I already was. Everything else in the episode was pretty standard LuPat fare and predictable. Kogure being fakeKairi and fakeMommyTsukasa was very obvious. The kaitous being kaitous stealing clothes and being able to outsmart pretty much everyone in the GSPO building is not a surprise either. That new Patranger theme sounded pretty good though. We did get a little bit of sketchyNoel during that little chat with Keiichiro, but I’m starting to really lower my expectations about his and Kogure’s secrets. I already know I’ll be disappointed in the big reveal. So even now, I’ll try to temper my expectations for that. Seriously though, where in the world is Zamigo? We need him, like, yesterday.